Synthetic diamonds are laboratory-developed or research center created diamond, its chemical and physical properties look like to those of actual diamonds. Synthetic diamonds (laboratory -developed diamonds) are otherwise called cultured or cultivated diamonds. These are fabricated in the research facility by utilizing chemical vapor deposition (CVD) or high pressure high temperature (HPHT) forms. The synthetic diamond market is divided based on the manufacturing process, product, application, type, and region. In terms of product, the market is segmented into dust, powder, bort, grit, and stone. On the basis of manufacturing process, the market is categorized as chemical vapor deposition (CVD) and high pressure high temperature (HPHT). According to the type, market is classified into rough and polished. On the basis of application, the market is segmented as heat sinks / exchangers, gem, high-end electronics, machining and cutting tools, laser & X-ray, surgical machinery, quantum computing, medical, water treatment, optical, sensors & scanning, and electrical. Synthetic diamonds display properties like real diamonds; thus, they are generally used in end-use enterprises which utilized diamonds. Surging demand regarding synthetic diamond in industrial usage will help the market of synthetic diamond. Synthetic diamonds are generally used in PC chip creation, machine production, construction, mining activities, (for example, boring for minerals), stone cleaning and cutting, gem exploration, medical procedure, experimental physics, space science, and electronics. Synthetic diamonds are additionally known for the utilization in oil and gas drills, since no other compound is fit for dealing with harsh situations. Synthetic diamond-based items are being utilized in household and industrial water treatment as well. Polycrystalline CVDs are a main segments in high-end amplifiers. Synthetic diamond locators of bright light particles are utilized at high-energy analysis services and are industrially accessible. In 2016, Asia Pacific accounted for the highest share of the global synthetic diamond market. Development of the region is fundamentally attributed to the advancement of industrial and gem sector, particularly in Japan, China, and India. As far as value is concerned, in 2016, Asia Pacific region was assessed to hold for over 45% of the share of the global synthetic diamond market. Purchasers in India principally go around gem-quality diamonds for adornments, while the shoppers China are increasing analysis for using synthetic diamonds in advanced innovations. In Japan, diamond wafer group delivers thin yet wide CVD diamond plates. These plates can turn into the reason for future electronic gadgets. As a result of these factors, Asia Pacific is anticipated to be among the most developing market during the forecast period. The synthetic diamond market in the Middle East and Africa is foreseen to grow within the forecast period because of the development of the synthetic diamond sector in the region, and usage of innovation to test synthetic diamonds by the best diamond delivering mines in Africa, for example, De Beers. However, Asia Pacific records the maximum share of the global synthetic diamond market, trailed by Europe and North America. This pattern is foreseen to keep going in the future years as well. Some of the major players operating in the synthetic diamond market are Applied Diamond Inc., Element Six (E6), New Diamond Technology, LLC, Sandvik AB, HEYARU GROUP, ILJIN co., ltd., Zhengzhou Sino-Crystal Diamond Co.Ltd., and Henan Huanghe Whirlwind. This report analyzes and forecasts the market for synthetic diamond at the global and regional level. The market has been forecast based on revenue (US$ Mn) and volume (Million Carats) from 2017 to 2025. The study includes drivers and restraints of the global synthetic diamond market. It also covers the impact of these drivers and restraints on demand for synthetic diamond during the forecast period. The report also highlights opportunities in the synthetic diamond market at the global and regional level. The report comprises a detailed value chain analysis, which provides a comprehensive view of the global synthetic diamond market. Porter’s five forces model for the synthetic diamond market has also been included to help understand the competitive landscape in the market. The study encompasses market attractiveness analysis, wherein end-users are benchmarked based on their market size, growth rate, and general attractiveness. The study provides a decisive view of the global synthetic diamond market by segmenting it in terms of type, product, manufacturing process, and application industry. These segments have been analyzed based on present and future trends. Regional segmentation includes the current and forecast demand for synthetic diamond in North America, Europe, Asia Pacific, Latin America, and Middle East & Africa. The report also covers demand for individual end-user segments in all the regions. The report provides the estimated market size of synthetic diamond for 2016 and forecast for the next nine years. The global market size of synthetic diamond has been provided in terms of revenue. 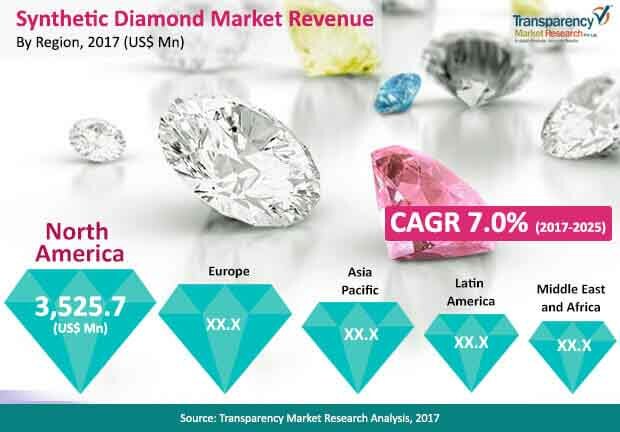 Market numbers have been estimated based on key type, product, manufacturing process, and application segments of synthetic diamond market. Market size and forecast for each major types, product, manufacturing process, and application have been provided in terms of global and regional markets. Secondary research sources that are typically referred to include, but are not limited to company websites, annual reports, financial reports, broker reports, investor presentations, and SEC filings, internal and external proprietary databases, and relevant patent and regulatory databases, national government documents, statistical databases, and market reports, news articles, press releases, and webcasts specific to companies operating in the market, National government documents, statistical databases, and market reports. Other secondary research sources are U.S. Geological Survey (USGS), Gemological Institute of America (GIA), International Diamond Council (IDC), World Diamond Council (WDC), International Diamond Manufacturers Association (IDMA), International Gemological Institute (IGI), and Industrial Diamond Association of America (IDA). The study includes profiles of major companies operating in the global synthetic diamond market. Key players in the synthetic diamond market include Element Six (E6), Applied Diamond Inc., New Diamond Technology, LLC, HEYARU GROUP, Sandvik AB, ILJIN co., ltd., Henan Huanghe Whirlwind, and Zhengzhou Sino-Crystal Diamond Co.LTD. Market players have been profiled in terms of attributes such as company overview, overall revenue, business strategies, and recent developments. The report also highlights SWOT analysis of the synthetic diamond market at the global and regional level.